I can’t get over how yummy all your brownie batter recipes are this week! These bars are a perfect treat for when you don’t feel like turning on the oven! Love it. i am loving each and every one of your brownie batter recipes Shelly! I love the huge brownie chunks in these. rice krispie treats are a perfect blank canvas for all sorts of fun add-ins and flavors! These look heavenly! Great recipe!! You light up my life one brownie filled recipe at a time. Love it! I want these in my mouth like right now. 🙂 Totally making these very soon. Thanks for Brownie Batter week! I can so relate to your life! Why do they not listen when we speak normally??? It’s ok, you made brownie batter krispies! Just withhold the krispies until they listen the first time! And, we all knew a brownie krispie was coming for sure since you are the queen of krispies:-) These do look all sorts of awesome!!! Loving all the brownie batter ideas! What a great week this is turning out to be! Love the “brownie” theme! I am loving brownie batter week! Love RKTreats of all kinds – even better with brownie mix and brownies in them! This is an eat your feelings kind of recipe. I like these. Oh man, I totally get you. I hate that 400th time, because it’s usually a yell and then there are tears or anger or whatever and “jeez mom you don’t have to yell at me!” Then my head really spins off its axis. 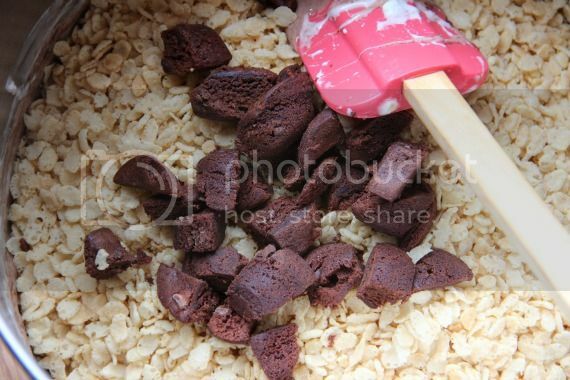 I love how you put brownie pieces in there, so yum! oh my good gosh, i’m loving this series! i love how you incorporated brownie batter into the desserts i never would’ve thought to incorporate it in…lol, my mom is basically the type of person who does that nagging and won’t take me not listening to her opinion for an answer..gets pretty annoying! Then he looks at me like I’m crazy because OF COURSE, he thinks it’s the first time I’m asking. Also, just because you say things directly IN FRONT of a man, if it isn’t actually TO them, they don’t hear it. It’s like a scientific fact. Who am I kidding, I want the whole dang pan. I…I’ve never thought of adding brownies to rice krispies before…but dang, it looks so GOOD! I have a few brownies…and a few krispie treats…hmmmm, it was meant to be! Fantastic! Just when I thought rice krispy treats couldn’t get any better! I have the krispies…just need to pick up a pack of mallows! I feel healthier just looking at these! I mean, rice krispies treats are like LIGHT desserts. At least..in my world. I am absolutely loving brownie batter week! This looks amazing…again! Loving all the brownie batter recipes! 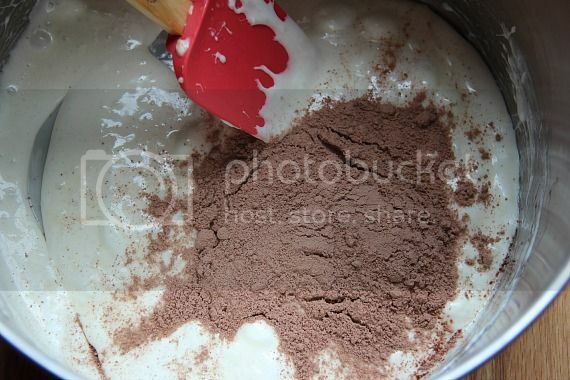 I love all these brownie batter recipes! I just made rice krispie treats for my family for the first time in years and they were all going crazy. I’ll have to try this variation! Brownies and rice krispie treats in one?! I NEED these! This is out of control and pretty amazing. I haven’t said this lately but you’re pretty amazing…you know that? I worry that because you are not baking this, you are basically eating raw flour. That can make you really sick. Why not just add a little cocoa powder?